In December 2008 the first turn of the specialized covered coal transshipment terminal was put into operation in the Port of Ventspils. 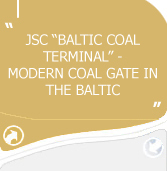 Owner of the JSC „Baltic Coal Terminal” – the joint venture of JSC „Ventspils Commercial Port” and LLC „Indtec Baltic Coal” which represent the interests of OJSC «Zarechnaya Mine», supplying coal from Russia. The project was financed by Latvian banks: AS DNB banka, „Nordea Bank Finland”, „UniCredit Bank”. The construction of terminal became one of the major investment projects realized on the territory of a Ventspils free port. The total amount of investments for the construction only of the first turn of a terminal is valued as 77 million EUR. So extensive investments are explained with the opening of the first in the Baltic region high – technology covered type coal terminal. The first turn allows to transfer up to 6 million tons per year. The construction of the second turn is also scheduled in the project. With the second turn, total capacity of the specialized coal terminal will reach 10.5 million.